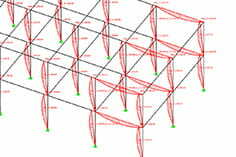 How can I perform a stability / buckling check on a tensile structure? 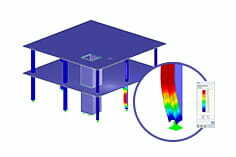 The proof of stability for tensile structures can be converted into a pure stress analysis, if the theory is considered to be 2-fold and the imperfection required by the standard has been applied to the system. With the help of the modules RF-STABIL and RF-IMP imperfection (resp. a preformed FE mesh). The type of imperfection depends heavily on the component and the standard used. For bars, which were modeled as a tensile structure, the values from DIN EN 1993-1-1: 2005 5.3 can be used. 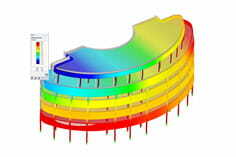 For flat surfaces, for example, the values from DIN EN 1993-1-5: 2006 Appendix C can be used. For trays, the problem is much more complex and there are different approaches. From a generation of imperfections I would advise against this and perform the buckle proof by means of MNA / LBA concept according to DIN EN 1993-1-6, which does not require an approach of imperfection. First A burden me comparatively (compared to. other internal forces in the load case) select high normal forces, in most cases the self-weight load case or a load case combination with the corresponding own weight is suitable. It may be necessary to provide each load combination with an individual imperfection. 4. Using RF-IMP, use the calculated eigenmode as the basis for an imperfection. In this case, for example, 1/300 of the carrier length can be used as the amplitude. 5. Create a load case combination that uses the generated imperfection as a basis and is calculated according to 2-order theory. 6. Perform a proof of tension on the basis of this load case combination, which at the same time is also proof of stability of the structure.